Put a slit on top and bottom of tomatoes and then put in boiling hot water for 3 minutes the peel comes off easy then. In stainless steel big soup pot pour the vegetable broth and add pepper corns +chopped ginger+garlic+ apple cider vinegar and celery. Once hot add corn. Wash quinoa and add to the pot. Crush the blenched tomatoes after peeling and add to the soup pot. Let boil for 10 minutes. Add baby spinach or your favorite greens.Simmer for 5 more minutes or until quinoa is cooked. Add salt to taste an enjoy!!!! Gluten free option for a hearty lunch or dinner time. Heating spices are great in cold weather. 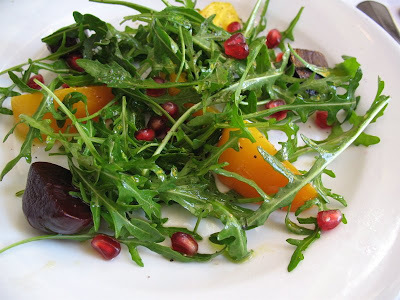 Method: Mix the arugula leaves and spring mix together in a big open salad bowl. Mix the dressings ingredients and set aside. Drop walnuts and chia seeds into the salad along with peppers and cherry tomatoes. Toss with the dressing and mix well. Great on its own or part of a summer menu!